Your kitty goes wild for pate, so give him the nutrition he craves with the Nutro Adult Chunky Loaf Salmon & Tuna Dinner Grain-Free Canned Cat Food. Featuring real salmon and tuna as the top ingredients in a whisker-licking loaf with yummy chunks mixed in, it provides plenty of protein for healthy muscles and delicious flavor for a satisfied tummy. Every bite is also packed with all the nutrients your pal needs to look and feel his best every day, like vitamins, minerals and essential taurine. Plus, it also provides plenty of moisture to help keep him hydrated and healthy from nose to tail! And with no grains, fillers or anything artificial, even sensitive kitties can enjoy. Adult wet food recipe features real salmon and tuna as the top ingredients for the protein needed to support healthy, lean muscles. 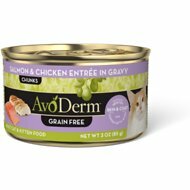 Soft loaf pate with smooth texture is perfectly lap-able and easy for cats to eat, with meaty chunks throughout for more palatability. To feed alone: Feed an 8 lb Adult cat about 2 cans daily. To mix with dry: Reduce dry food by 1/4 - 1/3 cup per can. For more precision, replace based on calories. Adjust food to maintain ideal body weight. Feed multiple small meals throughout the day. Refrigerate unused portion for up to 3 days. Feed at room temperature. My cats are 20+ years old, so they don't have any molars left, and they wont eat anything with slices, morsels or even flakes. My concern with this product was that the chunks would be too significant and would get left uneaten. Happily, this was not the case. After weeks of feeding, they are still excited about this food. This food has just about perfectly moist, so I can feed them without mixing it. My kitty’s diet was altered when the local pet shop discontinued the brand he was on for 15 years! Chewy.com to the rescue! However, a product at Chewy changed recipe! Finicky dude’s loosing weight quickly. Customer Service immediately suggests the Nutro. Ahhh, he’s eating again! Thank you for the excellent care & service!!! I'm impressed with Nutro's quality. 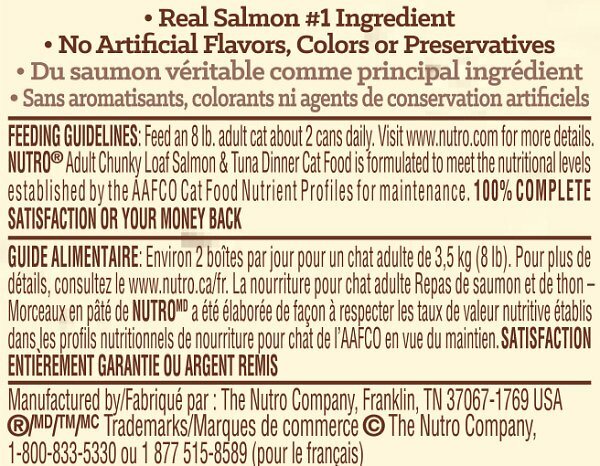 All the Nutro wet foods smell like real food -- not like "cat food" -- which I think is a big plus. I just wish the Salmon & Tuna Dinner and Chicken Dinner came in soft loaf rather than chunky loaf; I mash the chunks of chicken so that it's more palatable to my cats. Yes, they clean their plates. I have 4 cats, and I worry about what I feed them. 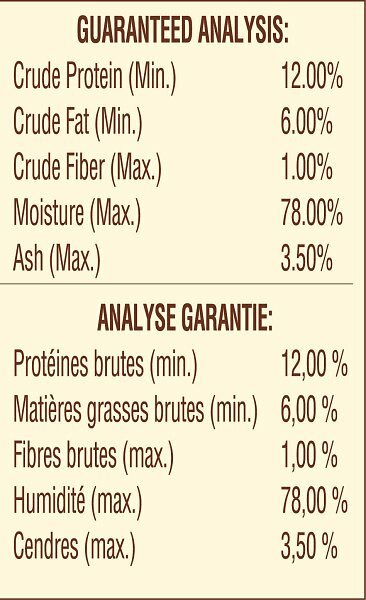 I have confidence in the Nutro foods. She loves this one ! This is one of her favorites for breakfast, lunch and dinner and the occasional midnight snack. This is the only food my 20+ year old cat will eat. I've wasted so much money on other foods that she wouldn't touch (the raccoons are grateful) but this one is a love connection. She rarely vomits when eating this - and it digests easily for her. I'll keep ordering as long as she will eat it! My cats like the different Nutro flavors but I can’t seem to find them in stores. Thanks for having a better variety, Chewy! My cat loves this. She is old and getting finicky, so, it's getting hard to find something she loves. This is it. She's happy and so am I. 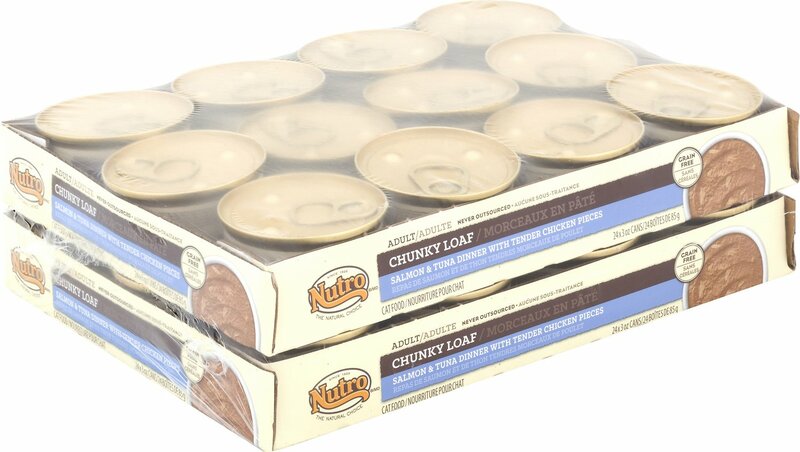 The Nutro line is pretty highly rated. 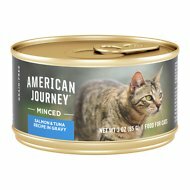 My cats (3 of them, one picky) all liked the flavor, but not so much the 'chunks' of tuna. None of them are big on chewing solid pieces-- whether it's sliced or chunks. But when I macerate the chunks, they all lick the bowl clean! 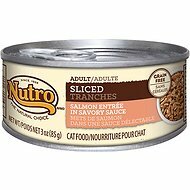 This food has help with my cats coat, their fur is so soft ever since they've been eating the Nutro brand.